If I asked you what your family’s favorite breakfast is, I would bet that many of you would say pancakes. Pancakes are hot and filling and they can be topped so many different ways that they never get old. If you’re tired of pancakes and syrup, try a few new combinations, like spreading them with peanut butter for even more tummy-filling power. Or jelly instead of syrup. How about fresh or thawed frozen fruit and whipped cream? That’s quite a treat to see on a breakfast plate! The only thing that makes me not love pancakes is having to cook enough to feed my taller than average husband and my strapping young men. Pancakes are best when they are steaming hot, so nobody wants to let them sit around while I make enough for us all. I found the solution to that problem though. I make pancakes up in huge batches and put them in the freezer. That way, we can have them whenever we are ready and each person’s pancakes can be nice and hot. If you love pancakes but don’t think you have time to make them, here’s an easy way to enjoy them more often with less mess and almost no time. Mix dry ingredients except for chocolate chips. Stir all together until everything is wet but not overmixed. Cool on pans before placing in freezer bags. To eat pancakes, set bag in frig the night before and heat pancakes in microwave or toaster. Here’s a little trick for knowing when to flip your pancakes; when you see bubbles on the top of a pancake and the edges are turning brown, it’s time to flip! Some folks prefer to slip a piece of parchment paper between each pancake in the freezer bags so that they can grab individual pancakes and not have to deal with the whole bag full. 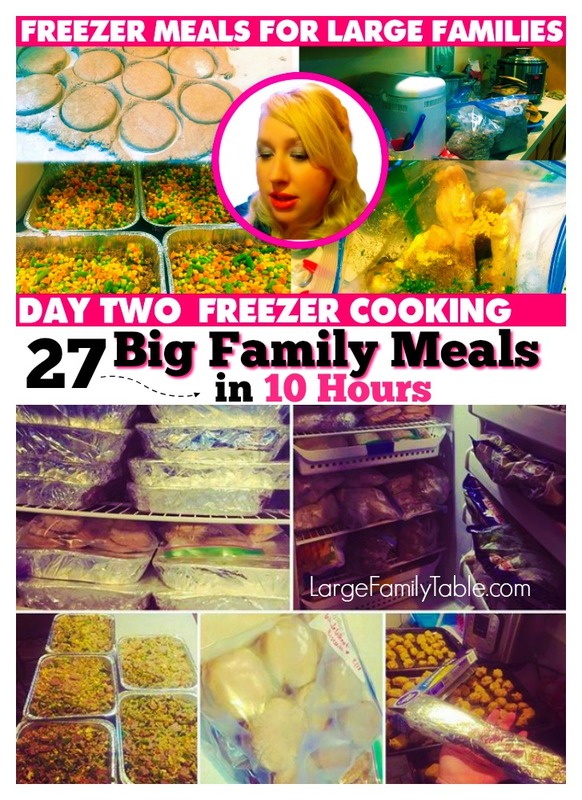 If you have a smaller family, that may work well for you. I just do the whole bag every time, which is about 14 pancakes, because we need that many for breakfast. If there are one or two left over, I can easily stick those back in the frig for a snack for later. 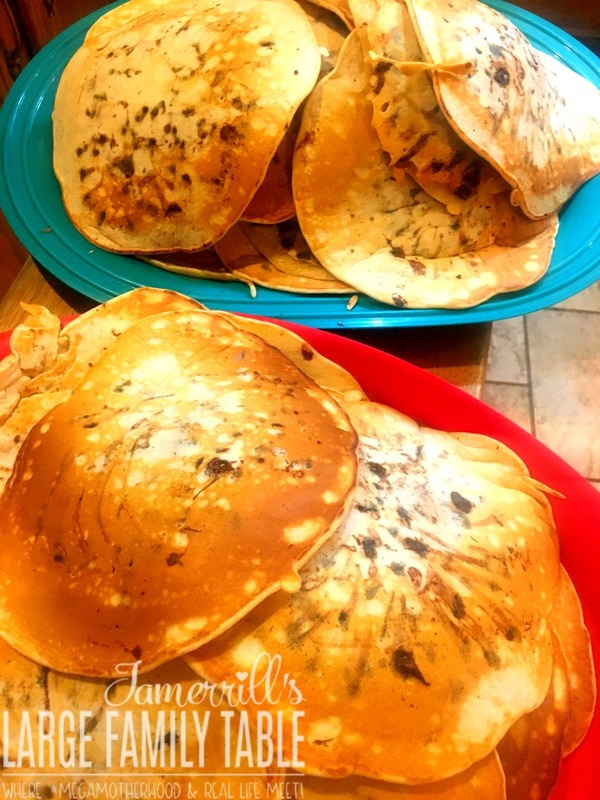 This Large Family Chocolate Chip Pancakes Recipe was in my 27+ Large Family Meals in 10 Hours vlog from my day two large family freezer cooking day. 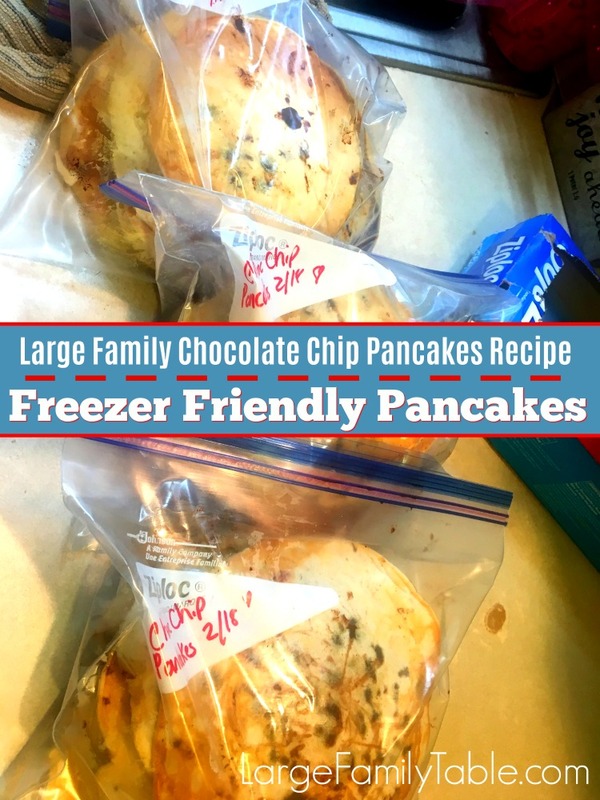 Let me know how your family loves this freezer friendly pancake recipe!